At Joseph Locke we take attendance and punctuality very seriously. Our attendance target for 2018-2019 is 97% for the whole school. School opens at 8:50am Monday-Friday and we expect children to be on time for class everyday. · Weekly class attendance and punctuality awards. 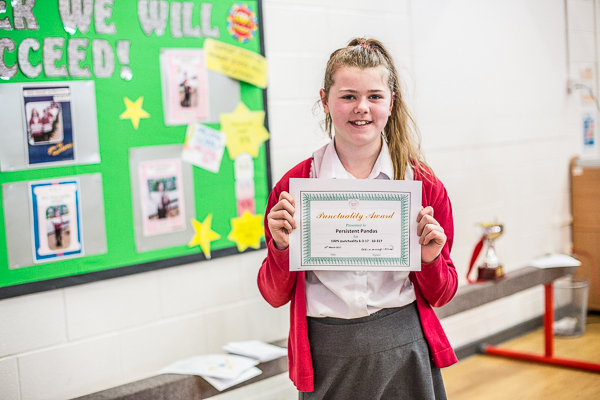 · End of half term most improved child. Cardigans, Jumpers, Polo Shirts and Fleeces can be ordered at the school office. PE Kit: Required from FS2 throughout school. Your child/ren will be given a water bottle to use in class, and a blue bag for their indoor pumps. Educational visits often require sturdy footwear or waterproof clothing however, parents will be advised by letter according to the activity. No jewellery other than stud earrings may be worn for school.